It’s no secret that I love the colour pink. It’s a shade that I think looks good on my skin tone, makes me happy, and represents love – what more can you ask for from a colour? I’m very aware though that when it’s used in abundance it can quickly become over powering, and a definite fashion faux pas. We’ve all seen an outfit like that at some point; pink dress, pink shoes, pink polish, and so on. The key to wearing a bold colour is to chose a few places to make it pop. Think shoes, lips, shirt, hat etc. 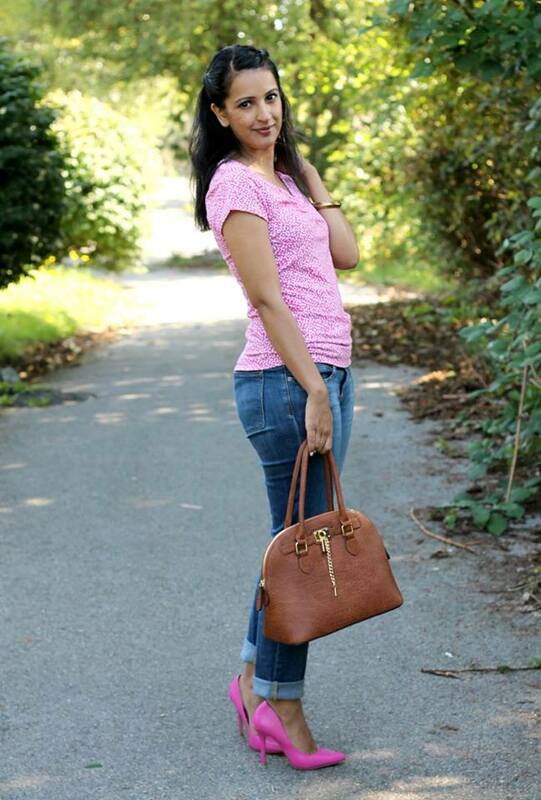 I rarely pair two pink pieces in one outfit, but today it felt okay since the jeans were in the middle breaking them up. Not sure if this would have worked for me with a tee shirt and skirt. I am so in love with these shoes! Seriously, pretty much every picture from today’s shoot was of me looking down! You might remember from my fall wishlist, one of my must have items was a weather proof bag for my camera and computer – this is what I chose. I love that it looks stylish but is still super practical because I carry my DSLR and a second lens almost everywhere! Also, am I the only person that has such issues with white polish? So many streaks. But ignoring the hot mess that my nails are, aren’t those the cutest rings ever. They are my new guilty pleasure and are only a buck or two for a set at Forever 21. Honestly, I don’t always love every outfit I share, but this one is giving me the warm and fuzzies. Maybe it’s the pink on pink action, or maybe it’s the simplicity of the whole look. After all, it’s just a pair of jeans from the GAP and a tee from Target, but adding the signature pink heels and pulling my hair back made them feel so special. That is what my style is all about, taking everyday pieces and making them sparkle. 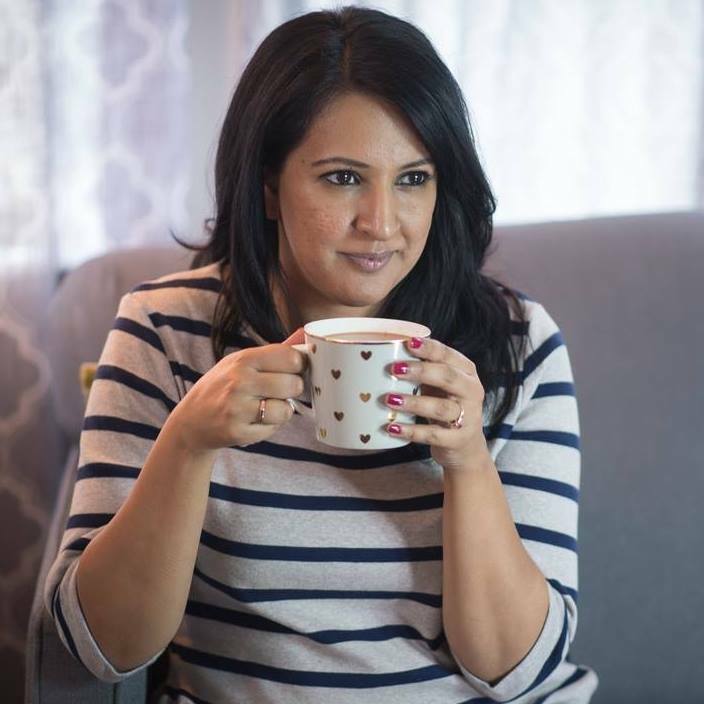 Psst: Do you follow Pink Chai Style on Facebook yet? I share lots of diys, dinner ideas, and outfits there that never make it to the blog! You always have the coolest shoes. I wish I could pull something like that off, but I’m not brave enough 🙂 I like the shirt a lot. Love the simplicity of it all. A signature piece or colour is a great idea. I am a big fan of pink too! The shoes look fabulous on you! And I’m seriously considering that bag, it’s beautiful. I am seriously loving your top. 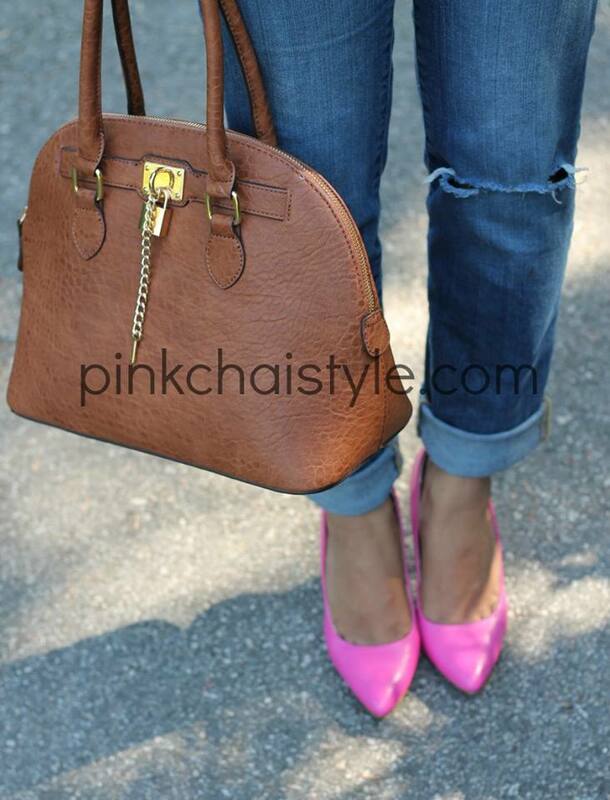 I seriously love that bag! Looks like you could fit a tonne of stuff in it and still look totally lady like! thank you – they are my favourite pink! It definitely doesn’t look like too much pink, I think the fact that you wore blue jeans balanced the outfit out nicely and gave you a pretty, put-together but still casual look. I love this outfit- not too much pink and super cute. i like pink but it’s not really the color for my skin- im cool toned so the neon reds and pinks and oranges really make me pop (in my opinion). nice bag, i personally wish it had a crossbody strap because the cameras are heavy (along with whatever other stuff mom’s need to carry). Oh my land, I LOVE those shoes! Pink is my absolute favourite colour to wear! And I do looooves me a pair of pointy-toed pink heels!